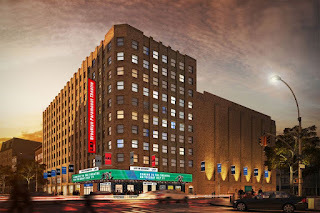 A press release 6/21/18 from BSE Global, headlined BSE GLOBAL AND LIU BREAK GROUND ON REIMAGINED LIU BROOKLYN PARAMOUNT THEATRE, with the deck "Revival of Legendary Theatre Underway." The press release has been repurposed in Billboard, Curbed, the Daily Eagle, and others. The projected opening is mid-2019. Note that the deal was announced in January 2015. Renovation plans announced in April 2015 projected a 2018 opening, with no transparency about the rent paid to Long Island University. A lease was signed in May 2016, with renovations said to begin in 2017. A May 2017 announcement that renovations would begin in Fall 2017 noted "an anticipated opening before 2019." BROOKLYN (June 21, 2018) – Executives from BSE Global and Long Island University (LIU) were joined by Brooklyn Borough President Eric L. Adams in a groundbreaking ceremony for the renovation of the LIU Brooklyn Paramount Theatre, located at the intersection of Flatbush & Dekalb Aves. in Downtown Brooklyn. The renovation and operation of LIU Brooklyn Paramount Theatre will be overseen by BSE Global, the same team behind Barclays Center and NYCB LIVE, home of the Nassau Veterans Memorial Coliseum. H3 is the architect of record and Shawmut will be managing the construction. The renovation will revive the 90-year old venue by retaining and restoring many of its existing features, while modernizing the space to meet today’s standards. The entrance will be moved back to the theatre’s original corner location at Flatbush & Dekalb Aves. ; a loge level balcony and box office will be reestablished; and updates will be made to the lighting, restrooms, and sound systems, among many other aesthetic upgrades. The renovation is expected to create 200 construction jobs, and nearly 100 additional positions at the completed venue. The theatre is planned to reopen in mid-2019. BSE Global will be responsible for programming the venue, which will be home to a wide range of events. While the theatre’s main focus will be revitalizing its legendary music roots, it will also host a mix of family entertainment, comedy, sporting events, special events, and private programs for LIU students. The 3,000 capacity venue will house a flexible seating configuration that will accommodate primarily general admission-style setups, with the opportunity to also do seated floor events. In addition, the venue will provide a variety of opportunities for LIU Brooklyn students to gain hands-on industry experience, including internships, work-study programs, part-time jobs, and more. Brooklyn Paramount operated from 1928-1962 as a live performance venue and was the first theatre in the world designed to show talking movies. The Rococo style ceiling and wall trimmings that still remain served as a grand accompaniment to many celebrated performances by artists such as Frank Sinatra, Ella Fitzgerald, Miles Davis, Bing Crosby, Buddy Holly, and Chuck Berry. After closing its doors, the theatre became part of LIU Brooklyn’s campus and served as a multi-purpose space for students, staff and guests.